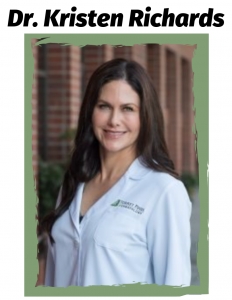 Kristen Richards, MD, Founder and CEO, Torrey Pines Dermatology. Board-Certified Dermatologist and Fellowship-trained Mohs Surgeon. A native of La Jolla, this talented dermatologist received her Bachelor of Arts from Stanford University and her medical doctorate from Case Western Reserve University School of Medicine in Cleveland. Dr. Richards received her dermatology specialty training at Northwestern University School of Medicine in Chicago, following an internship in pediatrics at the University Hospitals of Cleveland. After completing her residency, Dr. Richards pursued her interest in skin cancer surgery and reconstruction through a fellowship in Mohs micrographic surgery at Vanderbilt University Medical Center in Nashville. Dr. Richards maintains staff privileges at Scripps Memorial Hospital in La Jolla, where she was the Dermatology Department Head. She is a Fellow of the American Academy of Dermatology, the American College of Mohs Micrographic Surgery and Cutaneous Oncology. As an international relations major at Stanford, Dr. Richards has spent a substantial amount of time living and training overseas. She most recently spent a year living in Spain with her three boys and is now fluent in Spanish. She thoroughly enjoys treating her Spanish-speaking patients and patients from all over the world.